Hello bloggy friends! I hope you are having a lovely April first. Have you been tricked today? 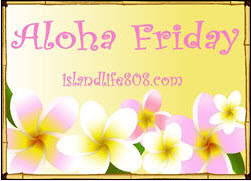 My Aloha Friday question today is: What is your vision for your blog? Where do you see your blog in 3 years? If you are not a blogger, what is one goal you hope to achieve in the next 3 years? I have to say that I vacillate when it comes to blogging goals. That is bad for my blog, I know. It is important to have a vision and concrete goals and then break them down into doable tasks. My biggest obstacle is time. There are so many ideas I have, but very limited time to accomplish them. Just visiting my favorite bloggy friends can be out of reach some weeks. One thing I know I need to work on is organization. I need to revamp the way my blog is laid out so that it's more user-friendly and easier to digest. I also need to work on branding and hone my posting topics so that they are more direct and less random. And then I need to just get out there more. As long as I have homeschooled kids and a family who needs me, that will be a push/pull struggle. What about you? What are your goals? Thank you so much for coming by today! I really appreciate your time and thoughts. Be sure to visit Kailani at An Island Life for more Aloha Friday fun. And Don't miss the Ultimate Blog Party blog hop at 5 Minutes for Mom. Enter to win my giveaway for a Chuggington: Chuggers To The Rescue DVD! I'm pretty much taking it one day at a time. It's a lot easier than putting stress on myself, which is what happens when I make goals like that. I have been blogging for a long time, and my goal has been consistently to tell the story of myself, my family and especially my kids for family and friends who are half the globe away. If I wasn't blogging, I'd be sending each letters/emails of the same content. I think, I have reached that goal and would like to continue on. I've been blogging for nearly 4 years and I've done just about everything there is to do. I've changed directions but now and in the future I'm pretty much with Charlotte and Harriet. I like to stay very freelance. That's the cool thing about blogging you can do whatever you like. I just want to keep enjoying it over the next 3 years. Found you through the UBP! I'm not really sure where I want my blog to go. I want to hone my writing skills and offer something useful for my readers instead of just turning it into a personal journal. Someday I'd like to use it to promote my published writings. I like your blog! I want a new design. I can picture it in my mind, but can't do it and don't have the moola to pay for it so I'll take it easy and love my space without pressure. I'm currently working on a new design in hopes that it will give me a whole new inspiration. Hello! Stopping on over from the UBP11 to say hey!! I just started blogging last month and figuring out this whole mess is hard yet exciting!!! Can't wait to learn more!